Philosophies on how to achieve vendor compliance might differ, but communication is the common theme underlying compliance-enabling technologies. In advance of the VCF Fall Conference, we’ve assembled a roundtable discussion on vendor compliance. 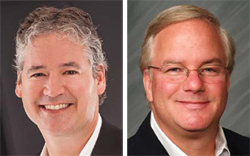 Contributing to the conversation are Greg Holder, cofounder, CEO, and chairman at Compliance Networks, and Paul Wagner, senior retail strategist at DiCentral. What are the leading vendor compliance issues retailers face today and to what cost? Holder: Cost is a tough question. Without hesitation I will say the leading vendor compliance issues are what retailers have been struggling with for years. Give me what I ordered when I want it and in the quantities requested. This is on-time and complete. Sounds easy, but as manufacturing continues to stay offshore, the problems persist. Beyond on-time and complete, I would say the issue is about inventory accuracy. In real terms, this is measuring the ability for the vendor to tell me what it is sending me. Today they do this with an ASN (advance ship notice) and an invoice. Too many times we see our customers auditing shipments at the carton content level only to find significant numbers of problems. We call these discrepancies ASN inaccuracy, and poor accuracy has a direct impact on inventory accuracy. Imagine retailers who blindly accept an inaccurate ASN as truth and book this inventory as fact. They are creating opportunity for lost sales in a replenishable environment. You can’t put a value on this. Wagner: One of the key leading vendor compliance issues facing retailers today is the measurement of vendor performance. Summarily, this refers to utilizing effective data collection tools and applying relevant metrics to drive performance improvement. Often, transactional data can be found in the retailer’s back office systems such as an ERP (enterprise resource planning), procurement, inventory management, or warehouse management system. Simple operational metrics such as fill-rate and on-time delivery are relatively straightforward and easy to compile. However, compiling a consolidated view of an individual supplier’s performance that includes the operational delivery performance in addition to other key metrics — such as quality, sales and margin efficacy, inventory liquidation, incident responsiveness, and social compliance metrics — are much more difficult to collate and report. To add to the complexity, it’s not just how to compile these metrics for an individual supplier, but using many of these same metrics to contrast the performance of vendors against one another. There are no standards that define vendor performance; each retailer has to create its own definition of performance and the related expectations. What is an efficient path to resolve these issues? Holder: Identify the problem, communicate it, then make both of those operations automatic. But this is the easy part. The next step is to get the responsible party to care about correcting the problem. We believe the way to do this is with a financial penalty for the failure. The industry calls this a chargeback or expense offset. Vendors care when it impacts their profitability, including future business. For vendors with the cost of chargebacks built into their cost of goods, we recommend a tiered penalty structure. For example, the more penalties a vendor has for a particular rule, the more expensive the penalty becomes. Wagner: One of the keys to solving the challenge of measuring vendor performance is the use of supplier report cards, otherwise termed as “vendor scorecards.” The metrics used in scorecards need to be specific and targeted toward managing supplier behavior, not compiling statistics for the sake of reporting but for the purpose of driving a material change in performance and behavior. The initial effort to define these metrics should be a cross-functional endeavor that includes accounting, distribution/ logistics, merchandising, planning, IT, inventory control, and sales operations. With a requisite deference to the intended audience, consideration should be given to the approach for delivery of the scorecard, both internally and to the supplier, including vendor portals, reporting capabilities, business intelligence solutions, and other delivery mechanisms. What technology advances are enabling these solutions? Holder: Adoption of supply chain execution solutions like warehouse and transportation management systems, order management, and even EDI (electronic data interchange) is digitizing much more of the data required to automate problem identification via sophisticated algorithms. However, it is necessary to have people in the DC performing manual audits to collect specific information about physical shipments of orders. The decreasing costs associated with data storage and computer processing power are enabling all of this data to reside in one central location, providing actionable intelligence to a wide range of stakeholders. Wagner: A number of advances in technology have improved the compilation and delivery of vendor metrics and related performance for retailers. Cloud-based services have evolved in the EDI and B2B (businessto- business) marketplace to enable organizations of all sizes to take advantage of B2B offerings, paying for services based on consumption and eliminating wasted investment in underutilized infrastructure. SaaS enables services that allow for subscriptionbased offerings designed to minimize capital investment while providing best-of-breed B2B functions that integrate with corporate procure-to-pay or orderto- cash system cycles. Managed services that provide supplier enablement, on-boarding services, and incident responsiveness/exception management are part of a number of service provider offerings. Web services for customized integration of purchase orders and PO changes, ASNs, invoices, and catalog/product information can be easily provisioned to minimize the trading partner’s technical support and development investment. Outsourced EDI VAN (value-added network) services can be enabled to ensure that the trading documents are accurately and securely transmitted to the trading partner.